has the enclosure for you! As with all industries, we've heard our share of stories of unique individuals using our product at times, or in ways, or in degrees which are not appropriate. For example, there is the story of the computer user who called to complain that the cup holder that came with her computer snapped off, and after some time the technical support representative deduced she had been using the CD drive tray as a cup holder. Or, the boy who, when performing his first oil change on his first truck, drained the transmission fluid and added five quarts of oil. And so, we hope you will appreciate this unique set of instructions of do's and don'ts regarding Cardinal Shower Enclosures. We've provided additional information to more fully explain each guideline. Cardinal Shower Enclosures, when properly installed, are designed to prevent leaks under normal shower conditions. Excessive water pressure or directing the shower spray directly at the door do not represent normal shower conditions and can result in leaks. Also, although some movies & comics show a shower or tub enclosure filled nearly to the top with water (6 feet deep perhaps), these are comic situations and we recommend that you don't try this with a Cardinal Shower Enclosure. For many people, grab bars in showers are a great assistance for getting in and out of the tub or shower. However, if your Cardinal tub or shower enclosure is equipped with a towel bar, you should not use it as a grab bar. It will not support your weight. Do not hang from it. Do not stand on it. If you use excessive force, it could snap off, shatter your shower door, send glass everywhere, or do goodness knows what. If you have small children who love to hang on things, and you are often heard to call them "my little monkeys" (in an affectionate way, of course), it's probably a good idea to instruct them not to hang from the towel bar. However, your towels and washcloths should be quite happy hanging from the towel bars. Do not use abrasive or acid-based cleaners when cleaning your Cardinal Shower Enclosure. There are some powerful cleaners on the market today. Abrasive or acid-based cleaners can scar the metal or glass of your Cardinal Shower Enclosure. It probably wouldn't happen with a single application, but it's best to use appropriate types of cleaners all the time. For best results, Cardinal Shower Enclosures should be cleaned with a squeegee or towel after exposure to water. Some individuals wait a long time to clean their enclosures (weeks, months, etc. ), and then express concern that they can't get water spots, mold, or other things off of their shower enclosures. It all depends on how clean you want your enclosure. For the best results, Cardinal Shower Enclosures should be cleaned with a squeegee or towel after exposure to water, or in the case of Cardinal Armor, by following the instructions above. Do not use excessive force when opening & closing your Cardinal Shower Enclosure. All of us at some point get angry. Some people are physically strong, some are naturally aggressive. If you use excessive force when opening or closing your Cardinal Shower Enclosure, you could shatter the glass. I mean, it is glass for goodness sake. Do not hang from or stand on your Cardinal Shower Enclosure. It's not designed to support your weight, so just don't do it. "I installed a two panel sliding clear shower door enclosure with hardware over my fiberglass tub in December of 2004. The shower is rarely used since it is in our second bathroom. In August of 2006 I went into the bathroom the day after a violent lightning / thunderstorm, and found my shower door had exploded into millions of small ¼” pieces. I immediately looked for damage to the walls and windows around the tub for evidence of a lightning strike, but found none. The other door and door hardware were fine. My only conclusion is that the sound vibration from the lightning strike shook the door and it either shattered by itself or was shaken into the shower door aluminum frame and shattered on impact." His enclosure was not a Cardinal Shower enclosure. This is probably a one in a million occurrence, and unfortunately it happened to Art, but that's why shower door manufacturers use tempered glass. In the event that the glass does break, you'll have millions of tiny pieces instead of sharp edged blades of glass. It's expensive to change your glass after your shower enclosure is installed, so we recommend that you consider all the factors that could be important to you. Do you own a mountain cabin, and have a lovely view through the enclosure out the window? In that case you might consider clear or Starfire glass to be your best option. Do you prefer a certain degree of privacy when showering? Perhaps an obscure pattern would be right for you. 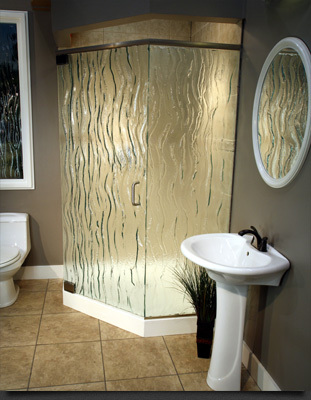 Is your shower enclosure the showpiece of your master bathroom? You might consider using Cardinal Art Glass. And, of course, we all remember the gorilla story. If you are cleaning fish in the shower, we recommend that you thoroughly remove all fish innards and sanitize your enclosure soon as your are finished. Not doing so can cause all sorts of trouble, especially if your have a significant other who is about to shower and doesn't appreciate the fine aroma of freshly caught & cleaned fish.